So I started this blog and then didn't post anything for months, but guess what? I finished grad school! This fall I was so busy student teaching. It was an awesome/crazy/stressful/productive/all-consuming experience. I learned so much, and I was in a class full of precious Kindergarteners. It was just the best. Before all the craziness began, I was gathering my materials. I had looked all over for a clipboard, because if there is one thing I had learned from previous field experiences and subbing, it was that I need a clipboard. It keeps me from scattering important papers about the room while I'm busy meeting the needs of 15-30 diverse little individuals. Well, I looked and looked and couldn't find anything I liked—so much plastic chevron print with a ribbon on top! So then I found a clipboard/folder/notebook made of chipboard at Target and I made it my own with a rubber stamp. 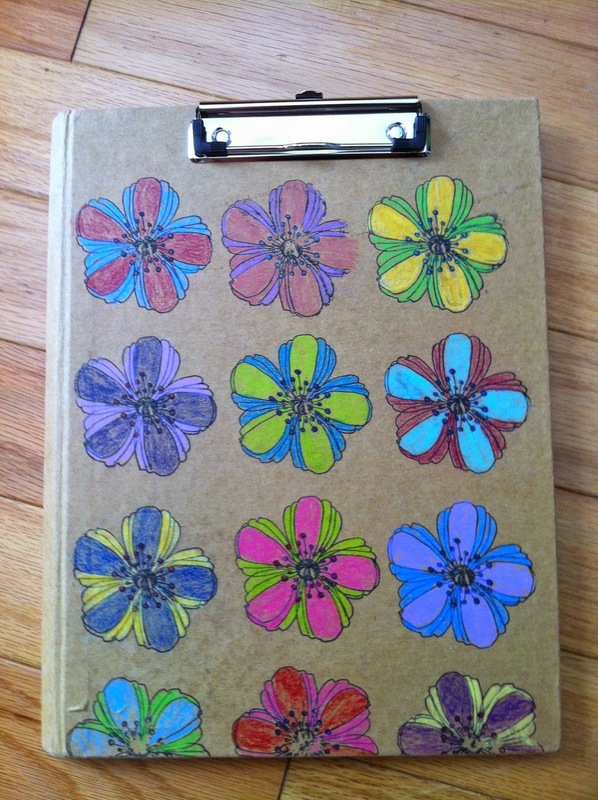 Then I colored all the flowers I stamped with colored pencils—so fun and relaxing! I love the way it turned out, and the little ones at school would notice it and ask, "Did you color that?!" Coloring—it's how you cultivate street cred with five-year-olds. To celebrate my graduation I spent a day bike riding in Gulf Shores on the Backcountry Trail. It was a beautiful day and so relaxing. If you're in the area I'd recommend checking out the trail. Bikes can be rented from the store in the adjacent state park. The trail has six distinct ecosystems. You can see big live oaks with Spanish moss, sand dunes, rosemary, longleaf pines, palm trees, and swamps with alligators. You might even see a bobcat or the mythical Catman! Hi! And thanks for stopping by Yarn, Glitter, Glue, where I document and share various creative projects. I’m a graphic designer making a career change to elementary education. (Student teaching this fall –hooray!) I’m also a Midwesterner living in the deep south, and a mom to two crafty girls. My husband is an artist and our craft cabinets are overflowing as you might imagine. Stop by for ideas in sewing, crochet, kids’ art, gardening and DIY home projects.